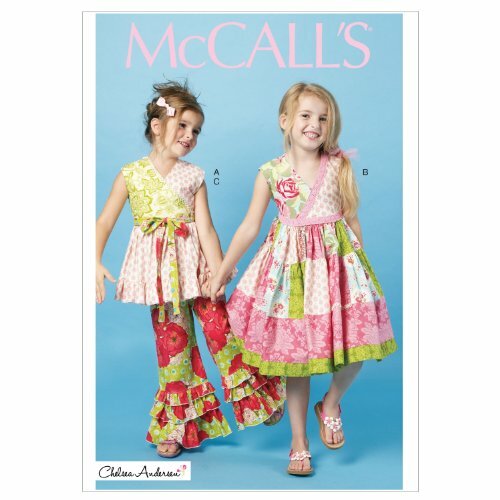 Children's/girls' top, dress and pants: pullover top or dress has self-lined, mock, wrap upper front/back, gathered lower front/back, back button closing and purchased trim. A: contrast upper right front and belt. Belt extends into tie ends. B: various contrasts and hem band. Pants have elastic waist, ruffles attached to bands, and very narrow hems. Designed for light to medium weight woven fabrics. Suggested fabrics: cotton, cotton blends, broadcloth. Notions: a,b: four 1/2" buttons. A: 1/2 yd. of 1/2" lace edging. B: 3 yds. of 7/8" lace trim and 13/8 yds. of 1/2" lace edging. C: 7/8 yd. of 3/4" elastic. with nap without nap with or without nap combinations: cdd(2-3-4-5), cl(6-7-8).